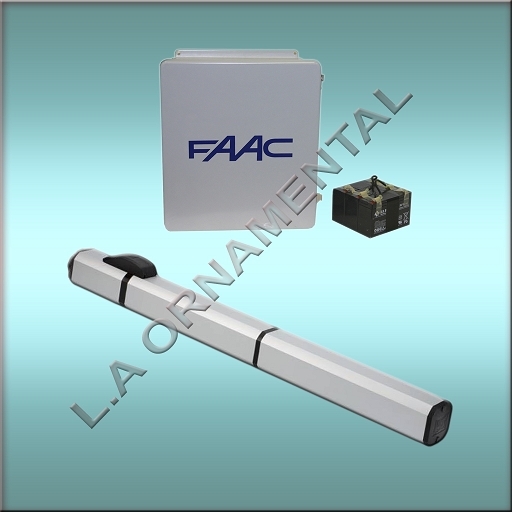 The FAAC S450H automated system for swing-leaf gates con­sists of an electrical pump and an hydraulic piston transmitting the leaf movement, assembled in a single block. Hydraulic power with maximum safety and at the same time simple and quick installation . and anti-crushing safety (obstacle detection). Duration & reliability: up to 4 times higher than an electromechanical operator. In hydraulic operators most of the components are in oil bath, therefore less subject to wear. Fast opening/closing speed: The S450H 24v operator can reach a maximum speed of more than 2.5cm/sec, i.e. more than 2 times of the current (hydraulic or electro-mechanical) operators on the market. Integrated mechanical stops (opening/closing): Practical add-on opening mechanical stops are standard and can be used when the mechanical stops cannot be installed in the ground. Maintenance: limited and cheaper with respect to an electromechanical operator eg in case of break-in an electro-mechanical operator is subject to irreversible ruptures and needs to be replaced, whereas hydraulic operators can be easily repaired (replacing the blocking valve). • Integrated opening/closing mechanical stops included in the operator Suits a wide range of installations thanks to the multi-position adjustable brackets. The encoder, integrated on the rear attachment, allows to perfectly control the operator in any position. Moreover, it ensures a very high accuracy in obstacle detection and a quick inversion, according to the UL safety requirements. hydraulic and 24V technologies. This means robustness, high performances, reliability, speed control and anti-crushing safety (inversion on obstacles).